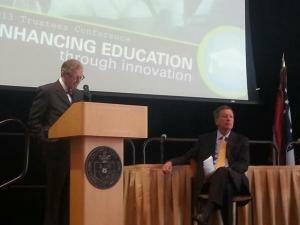 To further advance his commitment to higher education in Ohio, Gov. John Kasich has called upon Dr. E. Gordon Gee -who has served as president at five of America's leading universities - to lead an effort to ensure that our state's public colleges and universities deliver greater value and quality to those they serve. Dr. Gee recently led the National Commission on Higher Education Attainment to chart a course for greatly improving college retention and attainment and, in turn, restoring the nation's higher education preeminence. 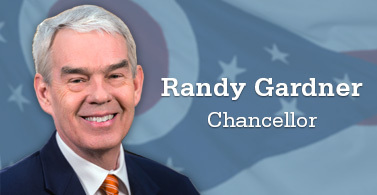 Now, he will consult with Ohio's higher-education leaders, the University System of Ohio and the business community to develop recommendations for the governor, addressing ways for universities to balance cost, quality and access. This effort will help ensure a seamless transition from K-12 to higher education and enhance Ohio's efforts to develop a workforce with the skills essential to meet Ohio's future workforce needs. Dr. Gee's report will be due next summer. Gov. Kasich feels strongly that issues of quality and value are among the greatest challenges facing universities across Ohio and the nation as students and their families struggle with rising tuition and fees, increasing levels of debt, and falling graduation rates. Dr. Gee's review will examine how Ohio can achieve higher quality to ensure the greatest value for its students and their families. Gov. Kasich has made higher education reform a key priority and his efforts have already put Ohio in a national leadership role in developing performance-based funding. Two years ago, Ohio's public college and university presidents made history by working together to successfully identify those higher-education capital projects that were most important to the state. They succeeded, and their collaborative approach won widespread praise. Building on that success, Gov. Kasich charged the presidents with crafting a new, performance-based higher education funding formula that rewards improved graduation rates, not just enrollment figures. That new formula ties 50 percent of a four-year institution's state funding on student graduation rates and aligns community and technical college funding to course completion. The current state budget builds upon earlier efforts to make college more affordable and for Ohio students and their families by limiting annual growth of in-state undergraduate tuition and general fees to no more than two percent at our four-year universities and $100 at our two-year community colleges. Looking at all sectors of higher education in Ohio, Dr. Gee's review will seek to better understand and measure quality in higher education, bring about greater value for the college experience and help institutions identify innovative ways to achieve improved operational efficiencies and cost effectiveness. Ohio has become a national leader in performance-based policies for its public colleges. Gov. Kasich's initiative will lead to recommendations for improving the quality and value of higher education in our state - a trailblazing effort that promises significant impacts on Ohio's public colleges and their students. A copy of the Quality and Value report can be found here.